Jenny is in her thirties – a choir member in our church. Frances, her elderly friend from our congregation, is in hospital, seriously ill. Jenny is very anxious, and wants me to accompany her to the hospital to pray for her friend. So it is that the following day we two plus another meet at the bedside. Frances is unconscious. We remain with her for a few minutes praying silently, then lay hands upon her and pray aloud. A further few minutes’ silence and there seems to be nothing more to be done. Two days later Frances dies. Jenny is beside herself in her loss – and I suspect in her anger too. It had all been a waste of time. Why had God not heard our cry? Why had God not heard our cry? The following week Frances’ son phones Jenny. “I just wanted to say thank you for what you did” he said. Jenny’s reply is short and to the point: “Well, it didn’t do any good, did it? !” “But didn’t you know…” comes the reply …. “Didn’t you know the change that occurred in Mum the minute you prayed with her?” And he told the story … until our visit Frances had been much disturbed, thrashing about in the bed. Clearly something was deeply troubling her, but – unbeknown to us – from the time of our prayer over her this had completely ceased. For the last two days of her life on this earth, Frances was visibly at peace. The healing ministry is an ancient one, attested in the Acts of the Apostles and the letters of the New Testament. After almost total disappearance from the mainstream churches in Western Europe, the mid‐twentieth century saw a resurgence which is still with us. This ministry is now evident in many churches across the denominations. Its forms vary, from quiet (even silent) prayer in private settings, through sacramental ‘laying‐on of hands’ possibly with anointing, and onwards to include noisy, dramatic expressions, some of which, sadly, have verged on abusive. Are all to be healed, or just a few? Does healing imply a return to healthy levels of physical or mental activity, or are there other manifestations? These two questions – the doing and the expecting – are interlinked. Get them wrong, and we find ourselves faced with ‘failure’ and a host of inappropriate responses: blame directed at the subject because he/she ‘hasn’t enough faith’; self‐blame and disillusionment on the part of those praying because ‘we haven’t enough faith’; seeking outcomes based on too limited definitions of healing and wholeness, and so on. This account tells of one such event; one set of expectations; one sense of failure; one occasion of anger directed at God, and blame directed at self. These could have been enormously damaging to the ministry in that place and to the people immediately concerned. How blessed we were to have that message of thanks from those who had journeyed with their mother in her final days, and had seen more than we had. But such feedback is not always forthcoming. Sometimes people do not think to make mention. Sometimes there is no one to provide the evidence or observation. Happily in this case, we were enabled to see that healing is broader than our expectations, and that it includes a good death. Ultimately the healing ministry is founded on faith – a faith that God knows what he is doing, and can be trusted. That remains so, even when we have no clue what is going on. If you enjoyed reading this, try Why Does God Allow Suffering? This article is one of many short pieces from the working life of a minister recorded by my friend Malcolm Nicholas. Malcolm has spent thirty years in ministry and still leads spiritual retreats at The Northumbria Community. 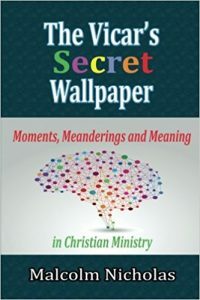 You can find the complete set of his gentle, hilarious, and sometimes profoundly sad moments in Christian ministry in his book, The Vicar’s Secret Wallpaper from which this piece is reproduced with permission. Yes, “healing is broader than our expectations”. Thank you! Thank you.. I agree healing can take many forms. And these days particularly with so much medical technology we easily fall into “extending life at all costs”. Sometimes its right to let go of people – or to put it another way, quality of life is surely just as important as length of life. “quality of life is surely just as important as length of life” … yes I think that’s definitely one of the take‐aways fro Malcolm’s piece — thanks!